Heat oven to 375° F (190°C) for shiny metal baking sheet or 350°F (180°C) for dark or non-stick baking sheet. Stir cookie mix, melted butter, flour and egg in medium bowl until soft dough forms. For 12 chicks: Shape dough into 12, 1-inch (2.5 cm) balls for bodies and 12, 1/2 -inch (1 cm) balls for heads. Roll balls in yellow or pink sugar. On ungreased baking sheet, arrange small balls on top of large balls to look like chicks. In bottom of large ball, place licorice pieces for legs. On each small ball, place 1 candy-coated chocolate piece for eye. Bake 7 to 9 minutes or until light golden brown. Immediately place candy corn on head of each for a beak. Cool 1 minute; remove from baking sheet. Cool completely on cooling rack. For 12 bunnies: Reserve 1/4 cup (50 mL) dough. Shape remaining dough into 12,1-inch (2.5 cm) balls for heads. Roll balls in pink or purple sugar. On ungreased baking sheet, for each bunny, place 1 ball and flatten slightly. 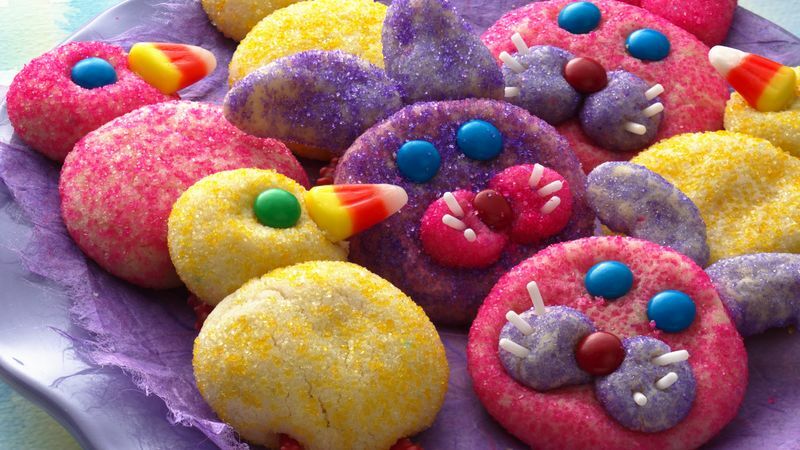 With reserved dough, shape bunny ears and cheeks and roll in sugar as desired; arrange on each cookie. Place 2 candy-coated chocolate pieces on each face for eyes and 1 candy-coated chocolate piece for nose. Place white candy sprinkles in cheeks for whiskers. Bake 7 to 9 minutes or until light golden brown. Cool 1 minute; remove from baking sheet. Cool completely on cooling rack. Tip: Create your own coloured sugar by mixing sugar with drops of food colouring in a small bowl. Gradually add food colouring until you get desired colour.